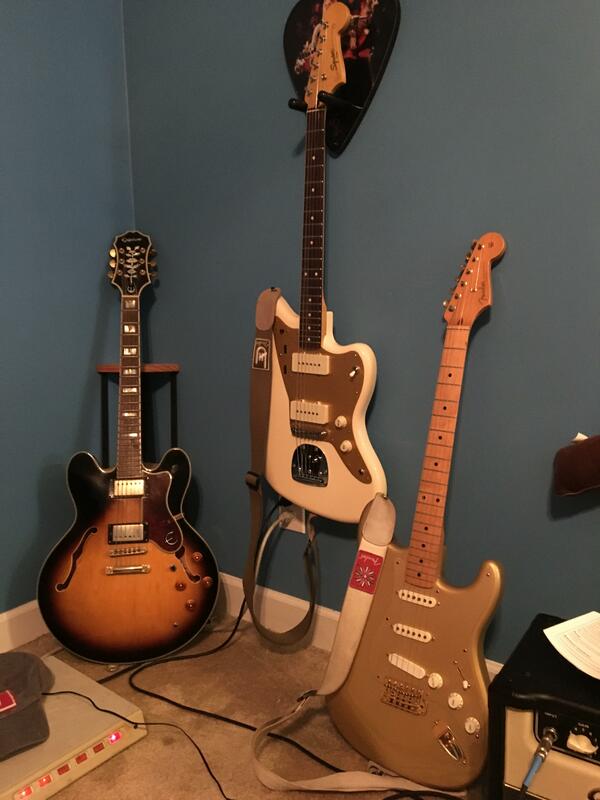 Epiphone Sheraton (Made in Korea), Squier J Mascis Jazzmaster, and last Fender 50th Anniversary Aztec Gold Strat. 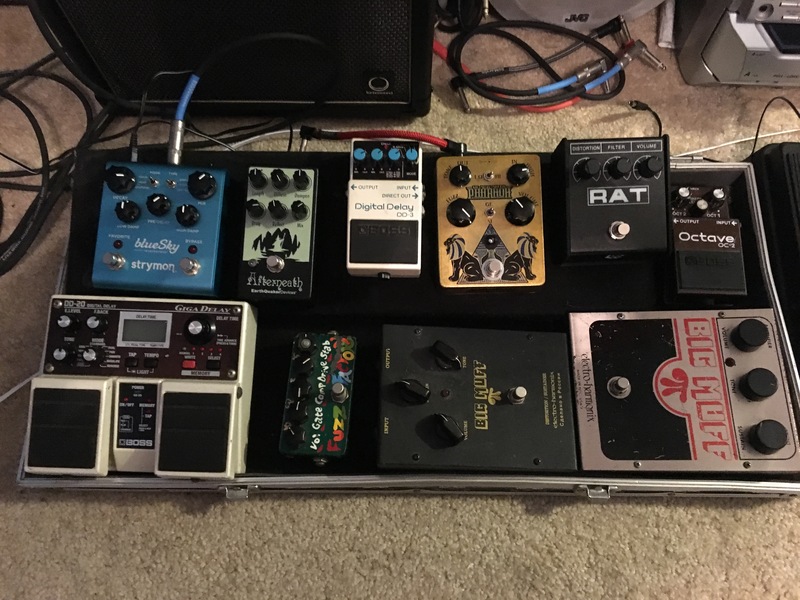 Strymon Blue Sky, EarthQuaker Afterneath, Boss DD-3, Black Arts Toneworks Pharaoh fuzz, Rat, Boss OC-2, Boss GigaDelay DD-20, Zvex fuzz factory, Russian Big muff, and EH Big Muff. Just bought the Jazzmaster 2 weeks ago and I LOVE it. Considering its Squier, the quality of the guitar is amazing. I play it more than anything else at the moment. It has Satin Neck Finish which makes it silky smooth with your hands, and the pick ups sound great just as they are (thought I would need to change them) but they sound identical to my old fender Jazzmaster. Not sure what pick ups they put if they are standard or something special. Also bought the amp along with the jazz master at guitar center, wanted the cheapest tube amp and that's what they had for 199$. At first, it seemed decent especially at the store it sounded much better than all of the solid states. Played with it for a while at home and didn't like that I was only limited to the tone control. But after playing with it for a while I gotta say this is a perfect amp for home practice amp or beginner amp. 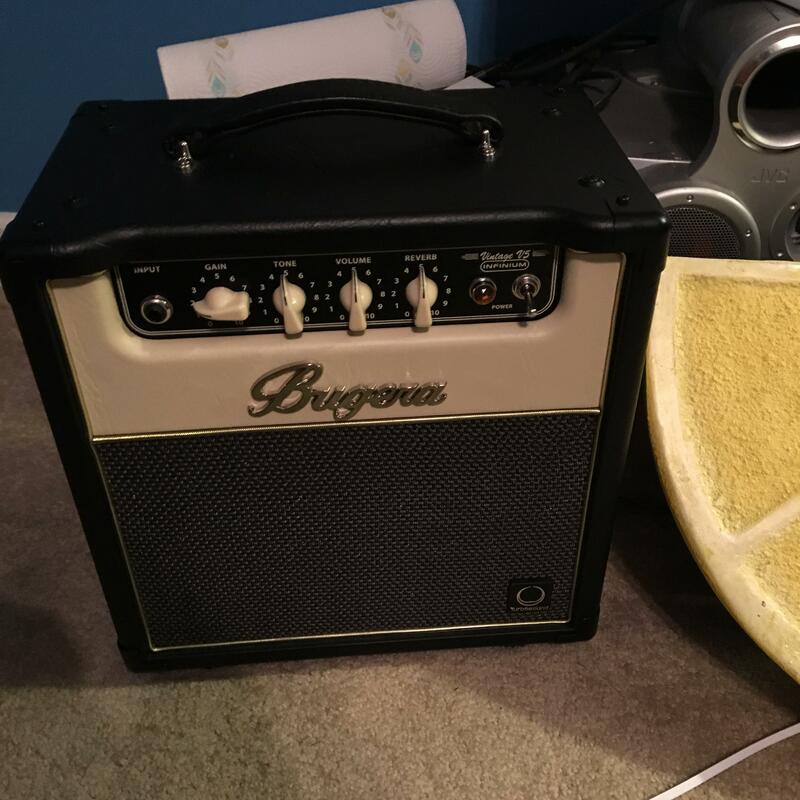 To give them a better idea of what a good amp sounds like. I got the Bluesky and Pharaoh today, so I've only messed with them a little bit. I got the Afterneath last week and been having a lot of fun with that, it's really quite unique as far as a reverb/delay. I got both initially to test them out and probably return one or keep them both if I really like them. The Pharaoh so far I have mixed feelings with. It has three switches in the middle with the middle being the fuzziest and loudest. The other two are both unique in different ways. Bottom switch is more like a Russian big muff fuzz but the volume drastically drops when you switch it from the middle to the top or bottom, which is annoying. The top comes off more of as an overdrive/distortion. And there is a top switch, Left is low, Right is High. It seems to boost the distortion when its set to the right and calm it when set left. I got to play around with it more to understand it, same goes for the blue sky. Does anyone do a muff style pedal that is switchable between Russian and USA? Might be a more useful solution to having both on your board. Or a double muff of some sort. That's a lot of fuzz, though. Check out The Pharaoh (( https://www.youtube.com/watch?v=8RTSJWBK4A4 )) This guy does some of the best demos IMO, check some of other demos out if you're ever interested in a pedal. 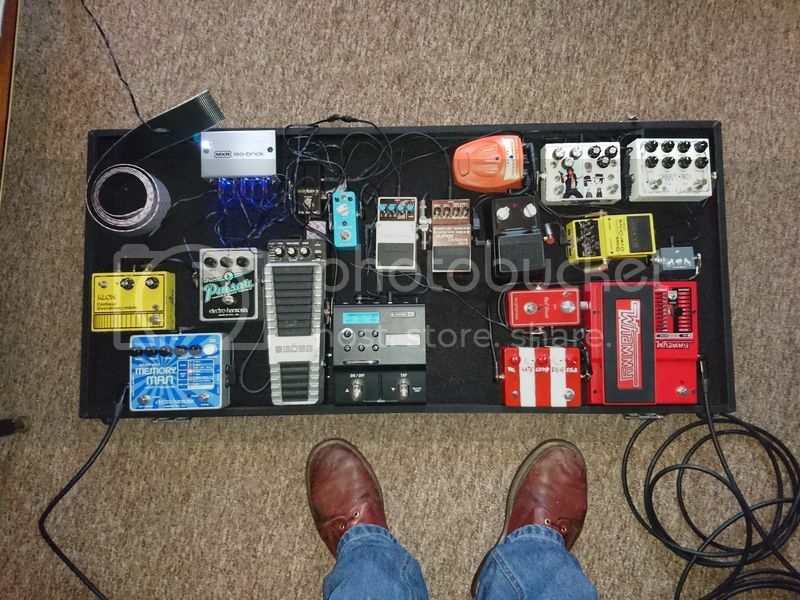 I don't know how but this dude has every pedal you can think of it seems. (( https://www.youtube.com/watch?v=U3pLsVBCjOQ )) This guy goes into a bit more detail about the pedal and explains it. This pedal has some really good versatility to it. I'm starting to love it the more I play it and understand the knobs. "Mark - I had some broken pedals lying around because friends knew that if they broke something, I would try and fix it or at least take a stab at fixing it. So I had a few in the closet in a box and basically I took the parts of all of them and made one that worked and it just happened to be a Big Muff, it was the black Big Muff, the Russian one and they were notoriously junky in terms of the wiring always breaking and it not working right. Anyway I had 3 of those and used whatever parts and got one working but hated the way it sounded. So I started tweaking on it and changing stuff until finally I got it the way I liked it. I think I put a couple of recordings up of the pedal in chat rooms back then and a couple of guys really liked it, asked what it was from and loved the sound and wanted me to make the pedal for them. That is basically how it started. It was really something that small and that was it. It just grew from there and honestly I have never caught up. Since the first day I said I would build one of these, I have never had a day that I have not had something to build." Also, check some of EarthQuakers Fuzz pedals like the Cloven Hoof, Hoof Fuzz (Germanium/Silicon hybrid) very similar to Russian big muff but much better. The Cloven hoof is the Hoof fuzz but with 4x the fuzz, honestly really want to try out the Cloven Hoof down the line one day. They associate it with stoner doom sludge stuff which I'm not personally into however I like the fuzz sounds, same applies to the pharaoh. Then EarthQuaker has Spires fuzz pedal which has two channels "Green" and "Red". Green channel features a cranked fuzz inspired by the Rosac Electronic Nu-Fuzz, it's a sonic-copy to the best of creator ability. The red channel is a silicon version of the discontinued Dream Crusher. I only own one of their pedals, the Afterneath, which is absolutely amazing. Checking out some of their other stuff in demos, they have a lot of good stuff out there and reasonably priced but they have gone up some of their upgraded versions. The youtube URL thing isn't working for whatever reason. New pedalboard and power supply. Today I have been troubleshooting and dooming out for the nosy spider that came down from the light shade for a listen. Think I'm losing a fair bit of high end. Many of my patch cables are quality ones that I made myself, and handful are generic cheap ones that I grabbed to put the board together and will do until I get the time to make more. I think I'm going to need some sort of loop box too. I think I'd like to have all the drives on a loop, and all the mod/delay on another, and have them both bypassable. The gap beside the M5 is for an expression pedal, which is the next addition. Got a plan for which one to get? The tiny DOD one that they announced at NAMM and haven't started selling yet. It's nice and compact. Yeah, but it is small. There's also a small Zoom one, but I don't know if it's 10k linear. I don't even know if that is something that I need to be looking specifically for, or is 10k linear pretty much the standard? There's a Bespeco one which is cheap and did fine when I had my M13. when I had my M13. I missed that, when was that? I recently bought a 10k linear pot to put into an old wah pedal of unknown make to try out with the M5 but I haven't managed to do it yet.